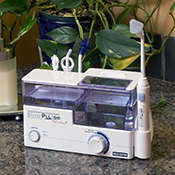 SinuPulse Elite advanced nasal sinus irrigation system with two sinus tips. 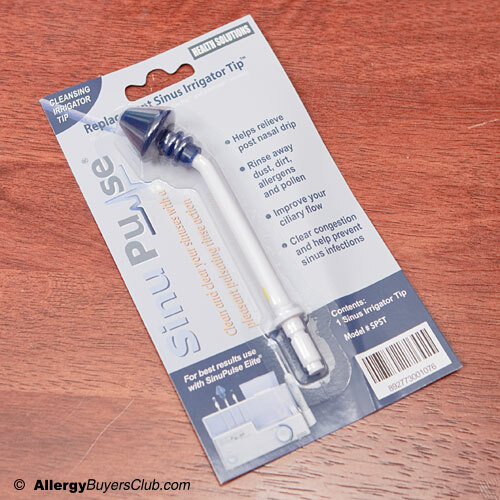 Relieve allergies and clean and clear your sinuses naturally and gently with SinuPulse Elite nasal irrigator. Ratings and Reviews. Includes irrigator, 1 nasal mist tip, 1 nasal spray tip, 1 standard throat tip, 1 mist throat tip. Sinus health tips. 30 SinuAir powder solution. Clean and clear your sinuses gently and pleasantly with the same sinus irrigation system used by professional sports teams and athletic trainers. The SinuPulse continuously gets a 5 star rating by doctors and consumers alike. This patent pending advanced nasal care system is unlike others as it offers not just one, but two pulsating spray modes, a moisturizing mist spray tip and a cleansing irrigation tip - it's like two systems in one! 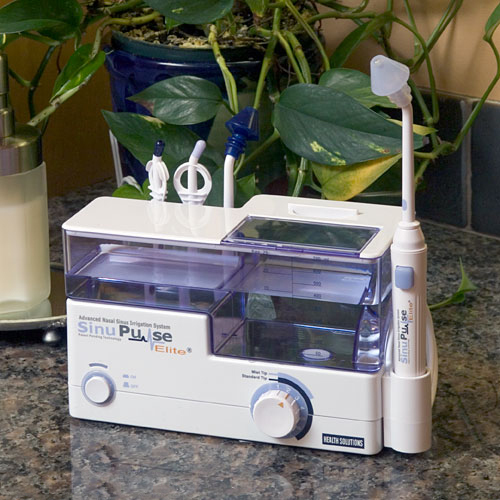 The SinuPulse Elite® is the ideal irrigation system to relieve post nasal drip, gently wash away dust, dirt, allergens and pollen, as well as improve ciliary flow, clear congestion and prevent sinus infections. It also features the added benefit of a state of the art throat irrigation system for sore throat discomfort and breath control. The enhanced throat irrigator tips provide soothing relief of sore throat discomfort and fresh breath protection. Extremely efficient and highly recommended! 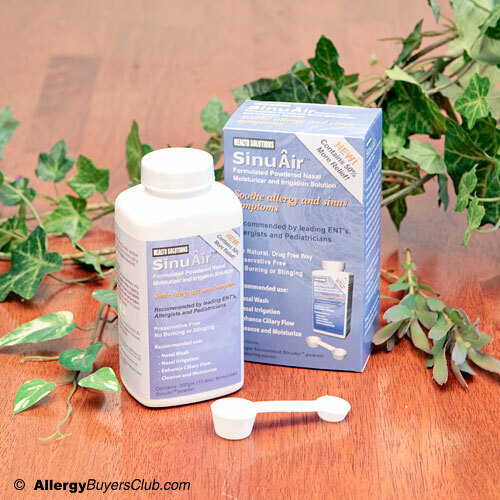 Best when used with SinuAir™ nasal moisturizing and irrigation solution. 2 year warranty. Click here for a Certificate of Medical Necessity Form for a possible doctor's reimbursement! If you are a practicing physician and would be interested in our SinuPulse referral program, please email us here. Helps relieve symptoms of sinusitis, allergies, rhinitis, post nasal drip, congestion and more. Rinse and empty the reservoir after each use. Replace tips as needed. From the early stages of product design through the manufacturing process to the actual customer use and recycling, Health Solutions take care to ensure their products are environmentally sound. Areas of attention include packaging design, materials, energy efficiency, and recycling. Efforts have been taken to safeguard the environment, as well as consumers’ safety by restricting the use of environmentally harmful compounds in the materials and manufacturing processes. The SinuPulse uses highly recyclable materials, is a low wattage device, and is energy efficient. "I recommend the SinuPulse Elite® from Health Solutions, it is the premier state-of-the-art nasal irrigation device and the only one capable of delivering both a gently pulsating moisturizing mist spray or a more thorough cleansing pulsating rinse. I've heard from people who have had an infection for months that within two days of beginning irrigation, the infection was gone, and did not return, even if irrigation was not continued beyond a few days. One of the most therapeutic measures in completely eliminating a sinus infection and treating sinusitis is use of the SinuPulse Elite® Advanced Nasal Sinus Irrigation System - it can help quickly and dramatically." 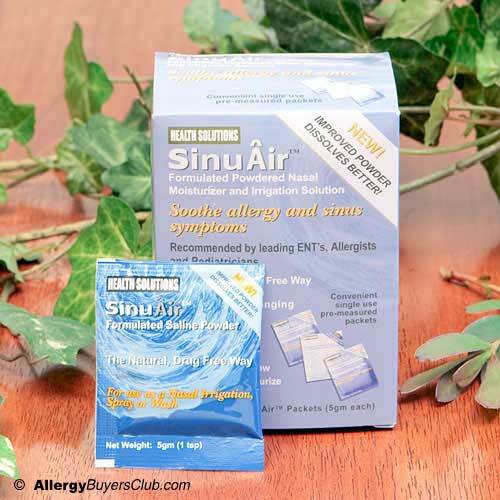 Includes 2 boxes of 30 pre-measured packets of SinuAir formulated powdered nasal moisturizer and irrigation solution. Recommended for use with all forms of nasal irrigation. For best results use with SinuPulse Elite Advanced Nasal Sinus Irrigation System. Includes 2 bottles of 300gm SinuAir formulated powdered nasal moisturizer and irrigation solution with measuring cup. Recommended for use with all forms of nasal irrigation. For best results use with SinuPulse Elite Advanced Nasal Sinus Irrigation System. 2 Replacement sinus irrigator tip for use with SinuPulse Elite. Also fits most Water Pik and Interplak models. Standard Flex Sinus Irrigator tip rinses away dust, dirt, allergens and pollen to help relieve post nasal drip, improve ciliary flow, clear congestion and prevent sinus infections. 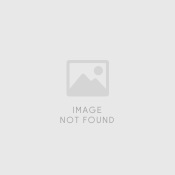 4 Replacement sinus irrigator tip for use with SinuPulse Elite. Also fits most Water Pik and Interplak models. Standard Flex Sinus Irrigator tip rinses away dust, dirt, allergens and pollen to help relieve post nasal drip, improve ciliary flow, clear congestion and prevent sinus infections. Click here for a Certificate of MedicalNecessity Form for possible doctor reimbursement!